Celebrity show jumpers wearing body protectors in TV’s Only Fools On Horses prompted an influx of enquiries at the British Equestrian Trade Association (BETA) stand during the CLA Game Fair. BETA devised and administers the internationally recognised BETA Body Protector Standard, as well as training retailers in the correct fitting of equestrian safety garments. “The number of falls the celebrity riders took certainly illustrated the value of wearing a well-fitting body protector. They managed to look rather glamorous in them too,” said Claire Williams, BETA’s executive director. Visitors to the BETA stand were able to obtain details of their local BETA-trained specialist retailers who can advise on the fitting and selection of body protectors and riding hats. Held at Broadlands in Hampshire, this year’s CLA Game Fair again featured a busy Hooked on Horses area focussing on equestrian interest. “We were able to remind a wide cross section of people that looking for the BETA sign is the best way to ensure reliable service and quality advice when shopping,” added Claire. 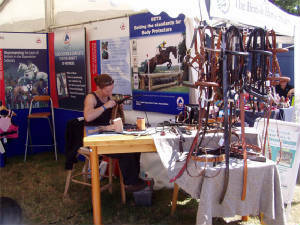 Sarah Stevens, an apprentice saddler at Gloucestershire based Stroud Saddlery, a BETA Retail Member, was also on the BETA stand giving live bridle-making demonstrations. The safety of equestrians when riding or driving close to wind farms and wind turbines has resulted in many differing opinions from the horseworld. Whatever your views, renewable energy sources are here to stay and will increase in the forthcoming years. The Government's recent Energy Review outlined plans for another big push on renewables up to 2020 and progress on their development can now be easily tracked via a dynamic DTI web facility that has recently been launched. On and offshore wind farms, solar power schemes, hydro electric and biofuel projects across England, Northern Ireland, Scotland and Wales can all now be located at the click of a mouse. "Due to the twin concerns of climate change and security of supply we stated in the Energy Review that we want to increase five fold the amount of renewable energy capacity we have in the UK. "The aim is for 20% of our electricity to come from clean, green energy sources by 2020 and that means a significant number of new schemes springing up. The interactive map that is going live today will allow users to monitor progress and will provide them with details of all the different types of projects being developed across the British Isles." The site gives descriptions of the projects, along with their status - approved, under construction, operational etc - and their installed capacity. The site also contains quarterly reports providing separate statistical updates on the delivery of renewable energy schemes in England, Northern Ireland, Scotland and Wales. "Wind energy is leading the renewables revolution in the UK, and the DTI's new dynamic map will be an excellent source of information for all renewable energy enthusiasts." While many equestrians won’t fall into the category of “renewable energy enthusiasts” the website will provide them with details of proposed schemes in their areas. More than a dozen equine organisations have established a network to improve communications with each other, the media and the public - in line with recommendations in the British Horse Industry Confederation's Strategy for the Horse Industry in England and Wales. The Equine Communicators Network (ECN) has been set up to provide a forum for those working within communications in the horse industry. The full agreed proposal is attached. Oliver Wilson, Director of Communications of The British Horse Society, has been confirmed as inaugural Chairman of the Group until July 2007. British Dressage, British Eventing, the British Equestrian Federation, British Equestrian Trade Association, British Equestrian Vaulting, British Equine Veterinary Association, The British Horse Society, the British Horseracing Board, British Show Jumping Association, the International League for Protection of Horses, Riding for the Disabled Association and the British Horse Driving Trials Association have formed the Network - agreeing a package of measures. Mr Wilson said: "All of us in the newly formed Equine Communicators Network are pleased to have established a cross-industry consensus on how best to communicate with each other, our members, the media and members of the public. I am very grateful to all the member bodies of the ECN and Defra for their support." Annie Dodd, British Horseracing Board nominee Director of the BHIC, said: "Patchy communication between the various parts of the horse industry has been much criticised in the past. This group will help us work together more effectively and make the most of opportunities such as the new website." The Confederation's website - www.bhic.co.uk - was relaunched with a host of new features at the National Equine Forum in March 2006. The site includes useful background information about the horse industry including the progress with the Strategy, careers and education, equestrian tourism, horse sport and voluntary opportunities. A link to a central media events diary under development by the BEF will be added shortly. Patrick Print FBHS, Chairman of The British Horse Society, has written to the Chairmen of the BEF, BD, BE, BSJA, Pony Club and RDA, inviting them to become BHS Vice Presidents. Explaining the BHS Board’s decision, Mr Print said: “The Trustees wish to build on the recent trend of improving relations within the equestrian community. He continued: “We are pleased that the differences of view which arose between the BHS and some other organisations in past years have been set aside, to be replaced by a genuine desire for co-operation and mutual assistance. Mr Print explained that although the Office of Vice President carried no specific responsibilities or obligations, except for those which the office-holder chooses to undertake, he hoped and believed that alliances would be created between the BHS and the other organisations that would be beneficial to the equestrian community as a whole. 28 July 2006 saw the opening of Black Pond Bridleway Bridge, which has been fully upgraded to equestrian standards to allow horse riders to safely cross the A3 near Esher Common in Surrey. The Highways Agency, supported by the British Horse Society, has also recently upgraded other bridleway bridges which cross the A3. The parapets have been raised from 1.6 metres to 1.8 metres and solid infill panels have been put in place, so that the horses can't see the traffic underneath. Children who are members of the pony club at Lower Farm stables were the first to cross the bridge and received rosettes to mark the occasion. Highways Agency project sponsor Tim Lyver said: "We are very pleased to be able to improve safety on our bridges for local horseriders. To the untrained eye there may be little difference to the bridge parapets but riders should definitely see the benefits of the upgrade." For general information about the Highways Agency and its work, visit the Highways Agency website http://www.highways.gov.uk, or telephone the Highways Agency information line on 08457 50 40 30 at any time. (Calls from BT landlines to 0845 numbers will cost no more than 4p per minute; mobile calls usually cost more.). The Ministry of Defence and British Horse Society high visibility (hi-viz) equipment giveaway - aimed at riders and horse-owners in areas encountering problems with low flying helicopters - has proved a great success. Demand for the free equipment was unprecedented, with more than 4,000 applications received for the 750 sets available. Priority was given to those riders in high-risk areas, who are especially vulnerable from being under the flight paths of MoD Low Flying Aircraft. As a direct result of this avalanche of applications, the MoD has funded an additional 550 sets of equipment which will be issued to those who are already on our waiting lists. They should receive their equipment by the end of August. The campaign has highlighted the importance of wearing hi-viz gear at all times, to Be Seen and Be Safe while out riding, whether on or off road, regardless of the time of year, time of day or weather conditions. V-Bandz supplied the equipment issued and offer an extensive range of hi-viz clothing for horse and rider. They can be contacted via their web site www.v-bandz.com. Sheila Hardy, BHS Senior Executive of the Safety Department, said: "The BHS would like to thank everyone who took the trouble to contact us, and we are sorry that many people will be disappointed at not receiving a free set. "We will try to acknowledge every communication received, where possible, but this will take time so we thank you for your patience." A GANG tried to hang a horse from makeshift gallows. Animal experts believe an occult group could be behind the attack. The mare - named Elizabeth - was found with neck wounds at her shelter in a field near Dunfermline. As the summer arrives, so does ragwort season. This innocuous looking yellow flower is in fact a harmful weed which is one of the most frequent causes of plant poisoning of livestock in Britain. Ragwort can have potentially fatal consequences to donkeys, horses, sheep and cattle that graze. "Ragwort poses a serious threat to horses and other livestock, but it also makes an important contribution to the countryside, supporting wildlife and providing a particularly important habitat for insects like the Cinnabar moth. "Controlling ragwort must be about maintaining a sensible balance, and most importantly making sure people are aware of the potential dangers and know how to effectively control and dispose of it." Defra investigates complaints about the spread of ragwort and other injurious weeds. In all cases, Defra would expect the complainant to have made contact with the owner/occupier of the land on which the weeds are growing to resolve the matter informally, before making a complaint to Defra. Complaints about injurious weeds are dealt with by the Rural Development Service at Bristol (0117-959-8622). 1. Ragwort is one of five injurious weeds specified in the Weeds Act 1959. If eaten, ragwort causes long-term cumulative liver damage in livestock and other animals, and can have potentially fatal consequences. Exact numbers of deaths are difficult to determine as the liver needs to be dissected. 2. The Weeds Act 1959 empowers the Secretary of State to take action to prevent the spread of Common Ragwort and the other four injurious weeds covered by the Act (Creeping or Field Thistle, Spear Thistle, Curled Dock and Broad-Leaved Dock). 3. The Weeds Act does not make it an offence to permit injurious weeds to grow on land. Under the Act, the Secretary of State has a permissive power to serve a notice on an occupier of any land on which one of the five injurious weeds is growing requiring the occupier to take action to prevent the weeds from spreading. The Act permits officials to enter land to inspect whether an enforcement notice has been complied with. If an occupier has unreasonably failed to comply with the notice he or she shall be guilty of an offence and on conviction liable to a fine. Where the occupier fails to take clearance action, the Secretary of State may take action to arrange for the weeds to be removed and to recover the cost of doing so, if necessary through the courts. 4. The Ragwort Control Act came into force on 20 February 2004 and amends the Weeds Act. The Act enables the Secretary of State to make a Code of Practice for the purpose of providing guidance on how to prevent the spread of Common Ragwort. Defra worked with stakeholders, such as The British Horse Society, Wildlife and Countryside Link, Network Rail, the Local Government Association, English Nature and the British Beekeepers Association to prepare the Code of Practice, which was published July 2004. Defra published a further guidance note on disposal options for ragwort to complement the Code of Practice in September 2005. DISASTER was narrowly avoided last week when several horses were maliciously let out of their Wellogate stables in the middle of the night, writes Sarah Williamson. Loftus, East Cleveland - A thoroughbred horse lost an eye and a pony was left with a pellet lodged in its head after a "senseless" air gun attack. A woman, who was killed when she was thrown from her horse near Thame (Oxfordshire) on Sunday (27/08/2006), has been named. She has been formally identified as 33 year-old Clare Clarke, of Youens Road in Thame. Police are appealing for information about the accident which happened at 3.50pm. A WOMAN living near Wellington is appealing for help to trace a car driver who collided with her horse. Sam Derrick, was out riding along Gerbestone Lane around 7.45pm on Thursday, August 10, when she notices a silver 4x4 approaching her from the opposite direction. Although Sam was fully visible and wearing a fluorescent vest, the driver continued on past a passing point waving his arms for Sam to get out of the way or go back. Although Sam couldn't move the driver kept coming at her and didn't slow down. She said: "I moved my horse as far over to the hedge as I could but the 4x4 still hit her and on impact she span round so she was facing the same way as the car. "To my horror the driver continued to drive forward driving into her back legs. A six-year-old boy is lucky to be alive after a wild pony kicked him in the head and shattered his skull during a family walk at a National Trust beauty spot. Launching the principles, Bill Callaghan, Chair of the HSC, said: “I’m sick and tired of hearing that ‘health and safety’ is stopping people doing everyday activities when at the same time others are suffering real harm and even death as a result of mismanagement at work. The Haringey launch of the principles is taking place at Somerford Grove Adventure playground in Tottenham where children and teenagers between 5 and 15 are actively encouraged to understand, assess and take risks to help them develop essential skills for life. Somerford Grove is the only adventure playground in the borough and provides a unique environment for children to learn about themselves and the world they live in. Attending the launch at Somerford Grove, Health and Safety Inspector Michael La Rose from the HSE, said, “Children encounter risk everyday and it is important that, through the activities on offer at adventure playgrounds like Somerford Grove, they learn how to enjoy themselves but also stay safe. • Enabling individuals to understand that as well as the right to protection, they also have to exercise responsibility. Commenting on the principles Jonathan Rees, HSE Deputy Chief Executive, said: “We want to cut red tape and make a real difference to people’s lives. We are already taking action to put the principles into practice; last month we published new, straight-talking guidance on risk management, but we cannot do this alone. That’s why I welcome the broad alliance of support for this initiative – organisations representing employers, workers, insurers, lawyers, volunteers, health and safety professionals and many others who have made positive contributions to our approach. · Five Steps to Risk Assessment and example risk assessments can be found on the risk management web pages on the HSE website at: www.hse.gov.uk/risk. The pages are written in everyday language for managers, not health and safety experts and include links to more information and a section for frequently asked questions. · The HSC has overall responsibility for occupational health and safety regulations in Great Britain. The commission consists of 10 people nominated by bodies with an interest in workplace health and safety. They are sponsored by the Department of Work and Pensions (DWP). The DWP minister for occupational health and safety is Lord Hunt of Kings Heath. · The HSE and Local Authorities are the enforcing authorities that work in support of the Commission. HSE looks after health and safety in nuclear installations, mines, factories, farms, hospitals and schools, offshore gas and oil installations, the safety of the gas grid and the movement of dangerous goods and substances, and many other aspects of the protection of workers and the public. The Health and Safety Executive (HSE) across the UK has urged people in rural parts to make sure that children don't come to any harm on the farm - especially during the school summer holidays that have just begun. Riding Safely suggests that there are often similarities between the equipment and premises used for agriculture and equiculture and so some of the following warnings may apply. Farmers and farm workers may be tempted to let children on or near tractors, combine harvesters or other agricultural machinery during the holiday period. Not only has it been illegal since 1958 to allow children under 13-years-old onto agricultural machinery whilst it is in use, it is also extremely dangerous to do so. "Sadly, the barn fire in Northumberland last November where two boys tragically lost their lives shows what can happen. "Between 1994 and 2004, there were 31 child deaths in the UK in agriculture and that is 31 too many. There were more accidents in the spring and summer than during the winter months and now that the summer holidays are here, it is even more important that children are kept safe from danger and that the farm yard is not used as a play yard"
Of the 31 deaths, nearly half had been struck by a moving vehicle, and asphyxiation and drowning were the cause of another seven deaths. Sadly, one child fell from a height and electrocution, contact with machinery, getting trapped and fire accounted for the other loss of lives. Simple, common sense measures can be taken, explained Dr Dodman, to ensure that children are kept safe. "A simple walk around the farm to check for potential hazards and removing them is quick and easily achieved. Move things that children might be tempted to play with or climb onto and cover and prevent access to things like sheep dip baths and grain silos. Provide a securely fenced play area with enough activities to keep young children occupied is ideal, but, should they wander off, then it's important that everybody working on the farm knows that they should stop work and immediately take that child back to somewhere safe. "We know that farmers are under pressure and there is a lot of work to do, but safety should never be compromised. For every tragic fatality, there are also lots of other serious accidents. Often, they have involved trespassing. Your children and their friends may well be aware of the dangers on farms, but it shouldn't be taken for granted that they will always heed the no doubt often heard advice about staying safe, and the risk to children who have trespassed on to farm land could be even greater. "So, please take care out there especially during the summer days and nights and make sure that children are kept free from danger and that children do not come to harm and risk." An albino British police horse is coping with this summer's heatwave with the help of 30 bottles of sun cream every day. A horse that is allergic to hay and straw dust has found a unique alternative for his bedding - shredded court papers.